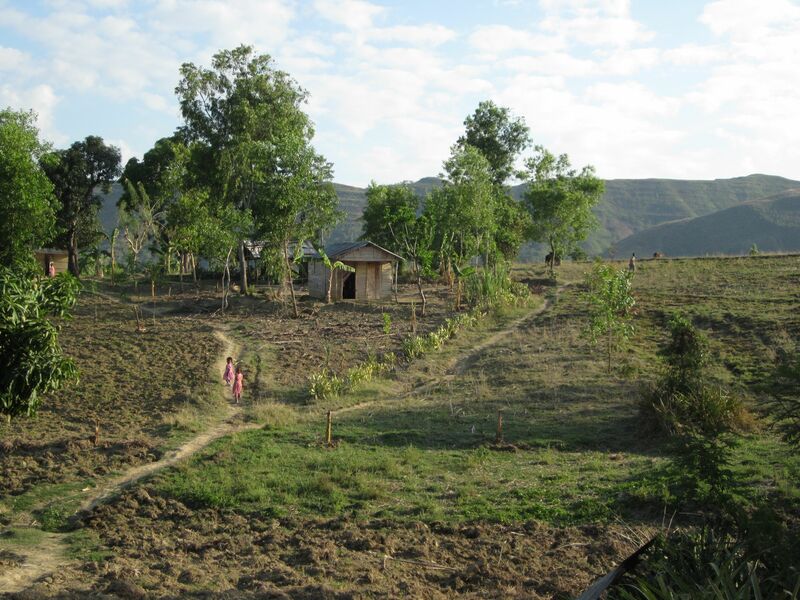 During my trip to Haiti in May, in which I visited different spots in Port-au-Prince and the country side of the Central Plateau, I thought a lot about the help that the country needed. The problems there are overwhelming: poverty, lack of clean water, poor education and social services, corrupt government, unfavorable US business practices. Where to start in all of this? This pile of garbage in Port-au-Prince was three feet high and covered half the street for over 100 yards. One of the most disturbing aspects of Haiti’s poverty during my visit was the horrifying abundance of plastic bottles, jugs, bags, wrappers, and more bottles. Here in the US, we have the infrastructure and the cultural education to haul our trash out of sight. Whether to a local landfill, China, or that swirling Texas-size pile of garbage in the Pacific, we have the means to rid ourselves of the petroleum-based packaging generated by our 1st world businesses. Haiti, lacking these means, has become mired in mountains of non-biodegradable packaging. 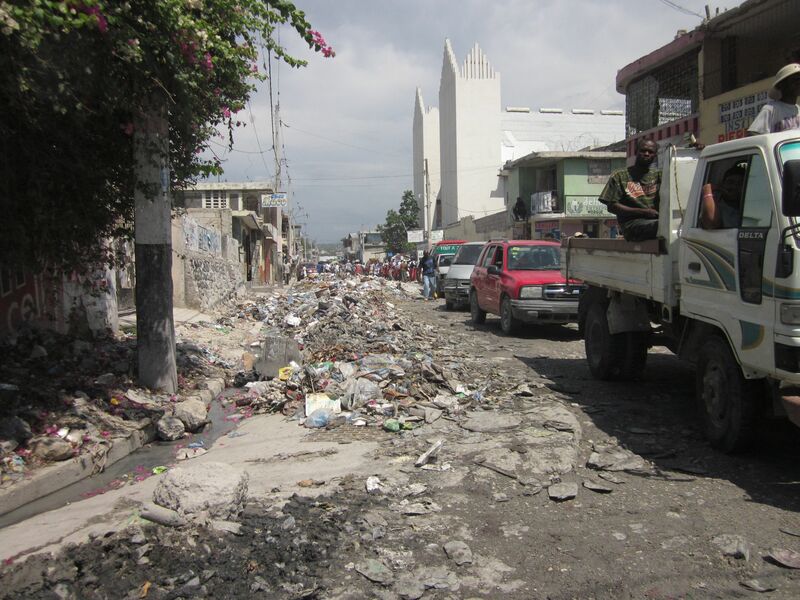 In one corner of Port-au-Prince, there were large refuse containers actually steaming plastic fumes into the air, as the uncollected garbage composted itself. Although the “Broken Window” theory undoubtedly has its limitations, I simply can’t believe that the filth, especially in Port-au-Prince, isn’t psychologically damaging to Haitian morale and sense of self-worth. Although people may live in extreme poverty, if their surroundings are clean, they can have pride in the home they maintain and the community they co-create. They can see the beauty around them. Engulfed in refuse, they are far more likely to feel that they subsist in an enormous garbage dump of an uncaring world, leading to emotions of hopelessness and resentment. Would you feel a sense of dignity if your front yard were covered in litter, and even if you piled it up, there was no where to put it? (Although, you could always dump it in your neighbor’s yard…). This question has troubled me since my return. In speaking to a friend familiar with Africa, he was telling me that the same problem exists over there. Garbage isn’t the most pressing issue, but it has everything to do with the context people live in. For as long as 1st world businesses continue to benefit from using cheap plastic for the products they export, without concern or responsibility for the post-consumption fate of their product, 3rd world importing countries will continue to see their once beautiful surroundings sink deeper beneath a sea of garbage. This is another slice of the global context we are co-creating. A very poor peasant hut in the Central Plateau -- trash is ubiquitous here as well, but this home gives a sense of the dignity of clean.